Are You A Blogger, Facebooker, Tweeter, Or Pinner? Or are you all of the above? 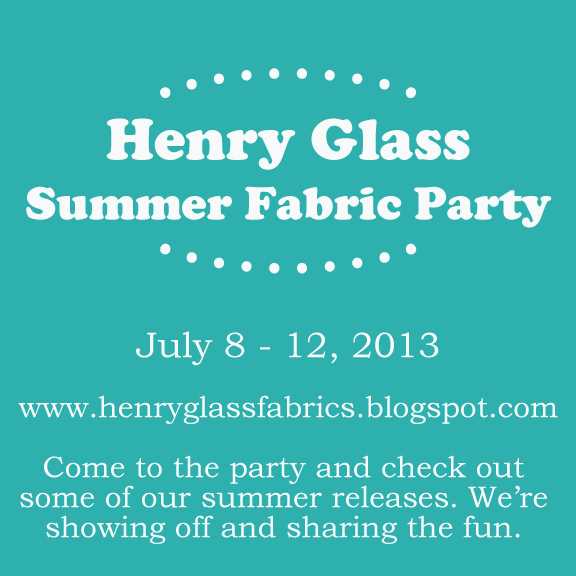 We're happy to announce the Henry Glass Summer Fabric Party. It's going to be all about our newest releases and you are going to be eligible to win some of the new lines. Do come for some fun and tell your friends too! Who's coming? We can't wait until the 8th! 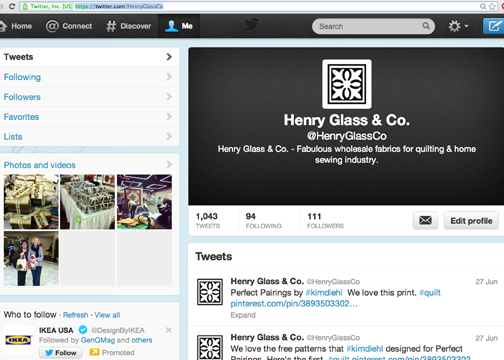 We want to sum up our fun places to keep you updated on the latest Henry Glass news. We'll help you keep up with us as you travel this summer. You've hit the first spot if you are here. 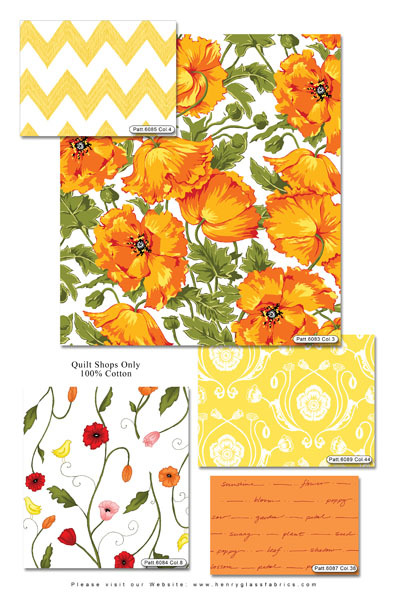 Our blog is a fun place to get to know the designers and the inspiration behind the fabric lines that we produce. 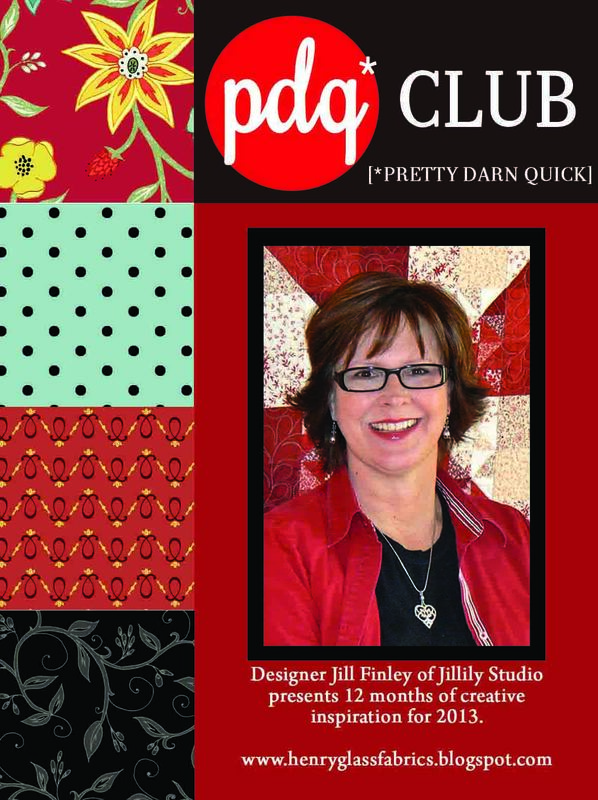 We host Jill Finley's pdq* Club [*PRETTY DARN QUICK] monthly free project and giveaway. You, the readers, have provided great inpspiration in taking part in the Desire To Inspire Challenge. We continue to look for volunteers to participate. We have received many replies and are working through the list for potential challengers. The list is long and impressive. You can click on the right column to be a follower here. We'd love to have you! Facebook has been a fun place for us too. 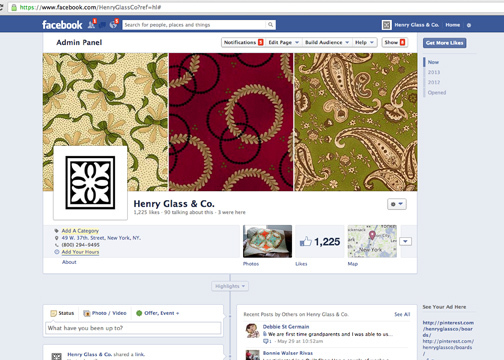 Have you liked our page? Tell your friends! The more the merrier. We are looking forward to hitting the 2,000 mark! Pinterest is our newest home away from home. We have started posting up boards for our designers and will continue to build some great walls for your inspiration. 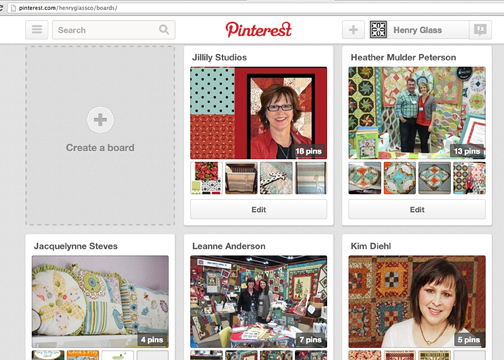 Follow us there if you are more of a "pinner." Twitter is a place for quick updates and it is new for us. Do you prefer to tweet? Where do you hang out in the social media world? Do you participate in more than one? There are more that we are exploring. Google +, Instagram and a few others are on our radar. 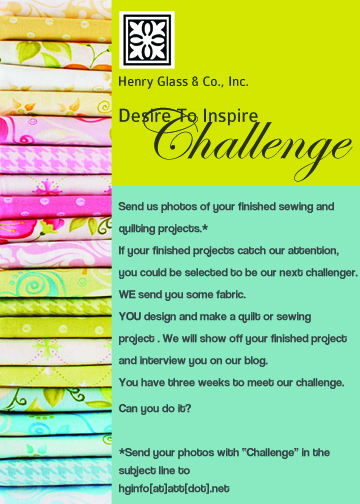 Our Desire To Inspire Challenge has been going on for a few months and we at Henry Glass have been constantly amazed by our talented readers. This month is no exception. You can find all of the other challenge projects at the link here. 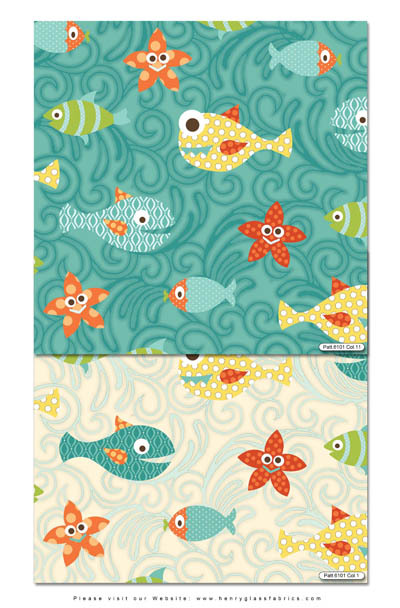 We sent her Heather Mulder Peterson's Here, Fishy, Fishy fabric. This adorable line should hit the store shelves in a few weeks. 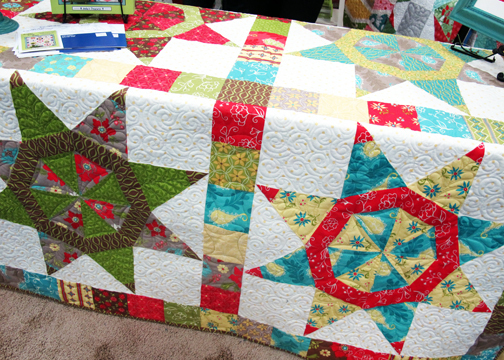 What came back was a fabulous quilt! 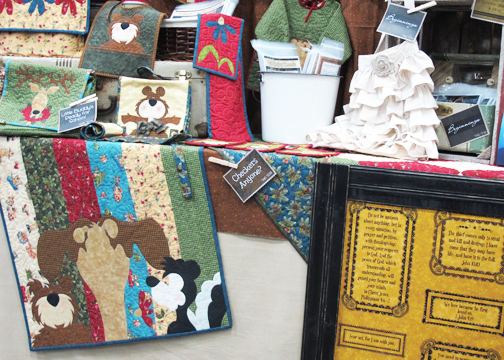 Let's meet this talented quilter. HG: Where do you live? Family? 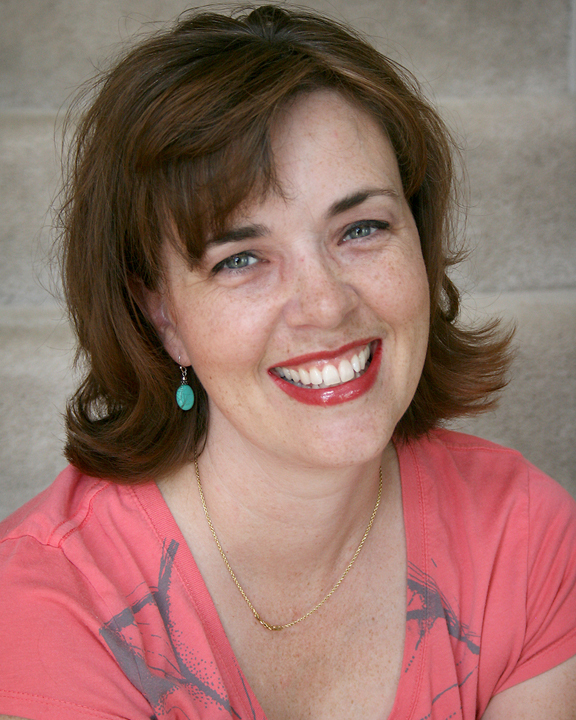 AK: I live in Maryland with my husband and two boys, ages 11 and 7. 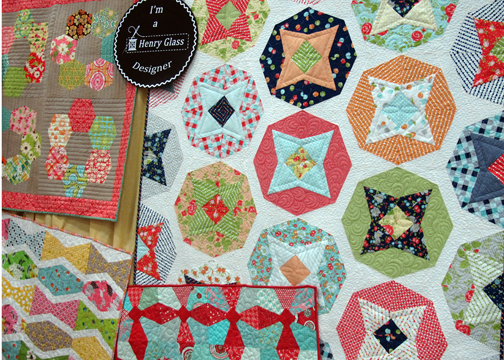 HG: How long have you been quilting? 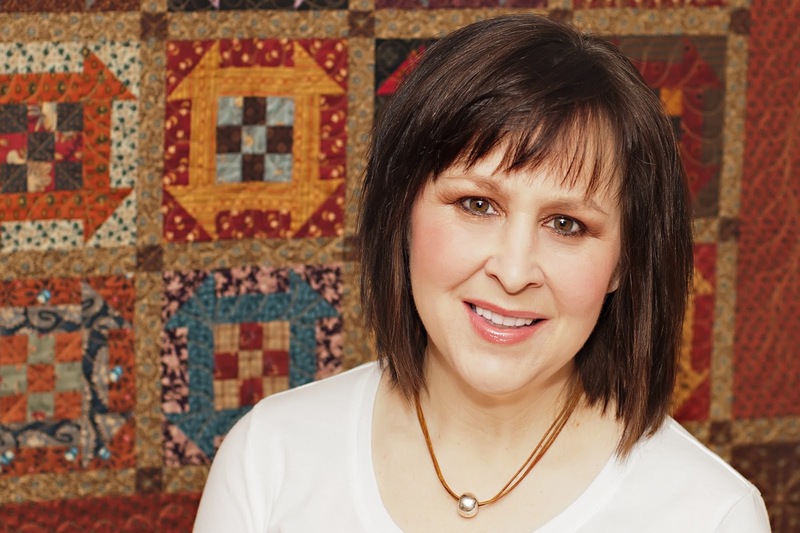 AK: I grew up quilting. When I was little, we mostly tied quilts on a big frame. One year for Christmas, my Grandfather made each of my Dad and his siblings big wood frames to quilt on. 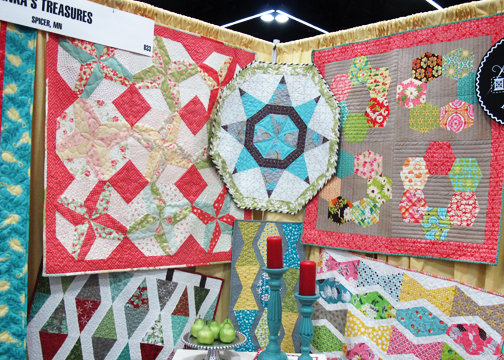 What I would give to have one of Grandpa's quilt frames now! AK: Hmmm. Favorite technique? How does anyone choose just one? 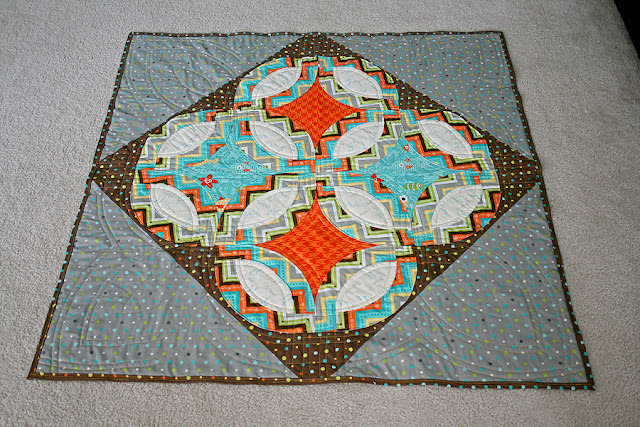 I know this may sound crazy, but I really like to square up my blocks because I know that the rest of my piecing is going to go smoothly when my blocks are perfectly square. 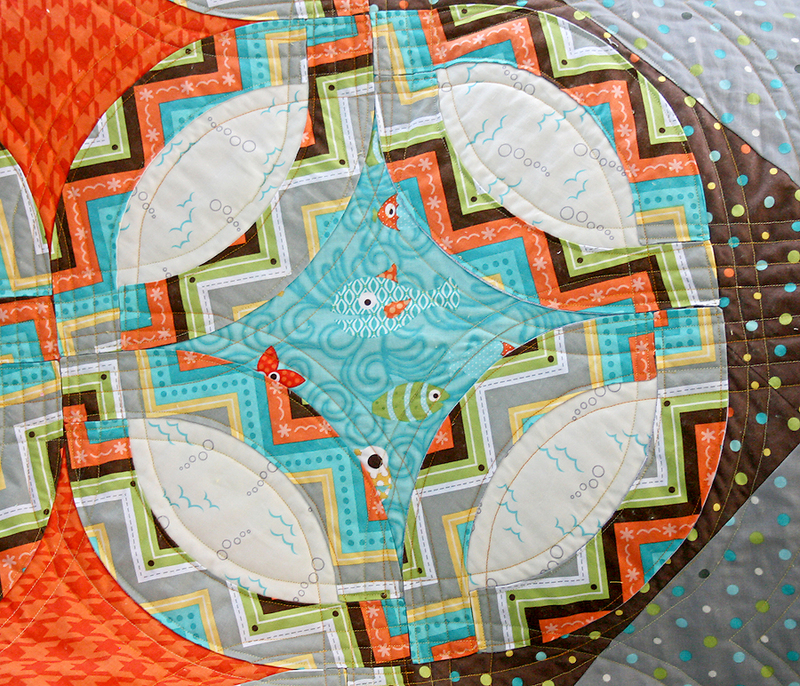 I really enjoy playing with free motion quilting, even if it isn't the prettiest thing. AK: I'm not sure exactly. 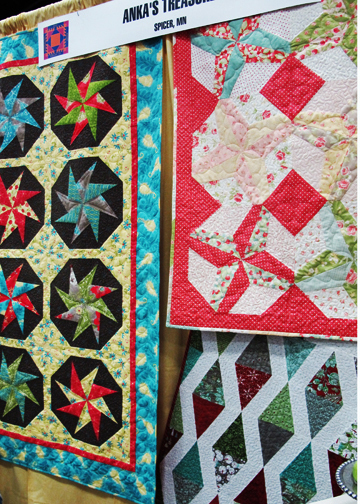 When I was young, we tied quilts. So piecing and tying would have been taught by my Mom and paternal Grandma. 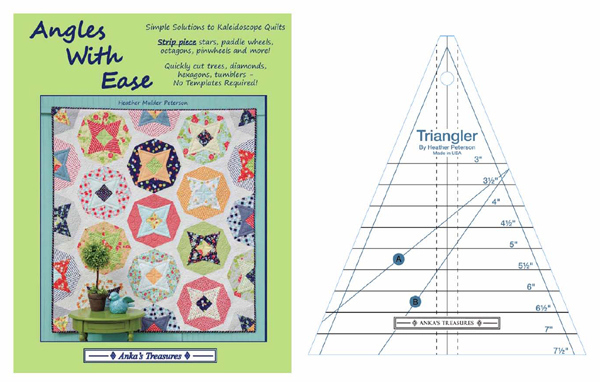 I played around to learn about free motion quilting. I learned to sew when I was a young girl. My sister and I went to sewing camp during the summer and we would sew clothes with my Grandma. Then I took general sewing classes in Junior High and pattern design in High School. AK: Yes! I love my guild. I belong to the DC Modern Quilt Guild. HG: Anything else you would like to share with our readers? AK: I'd just like to say thanks for letting me play with your wonderful fabric. It was so much fun. Thank you so much for this opportunity to get to play with your lovely fabric. 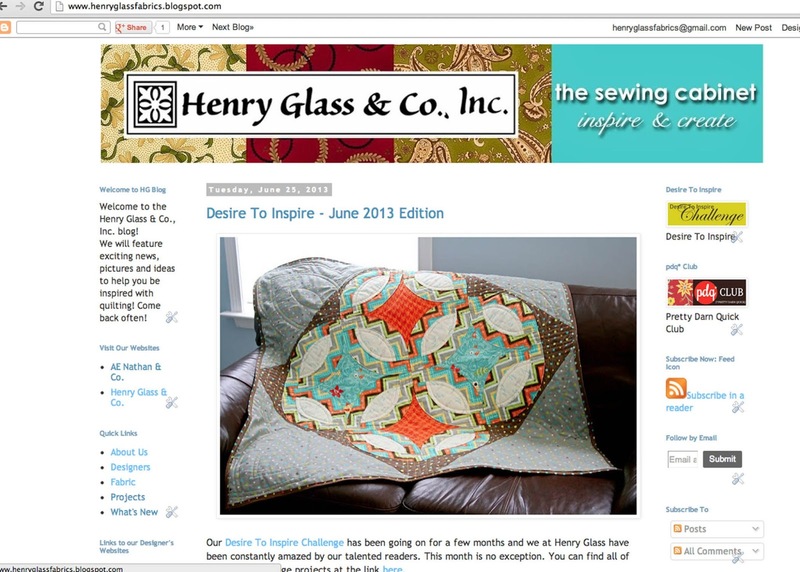 The two designers of Henry Glass that I adore most are Margot Languedoc and Heather Mulder Peterson. 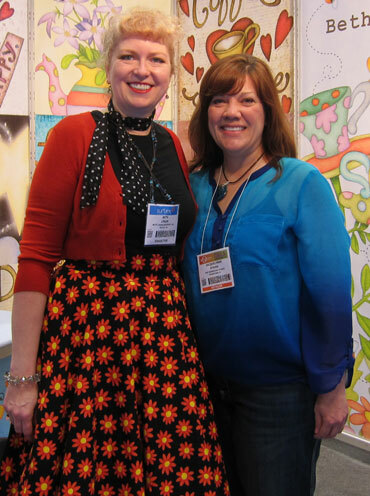 I was thrilled to receive fabric from Heather Milder Peterson! I have followed her blog for a long time and in my head, we are friends. 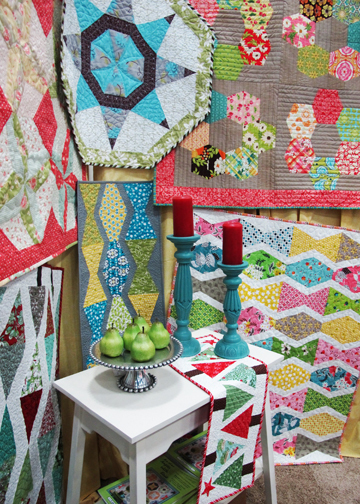 I've always thought a double wedding ring or pickle dish quilt would be fun to make. It has been on my bucket list for a long time. 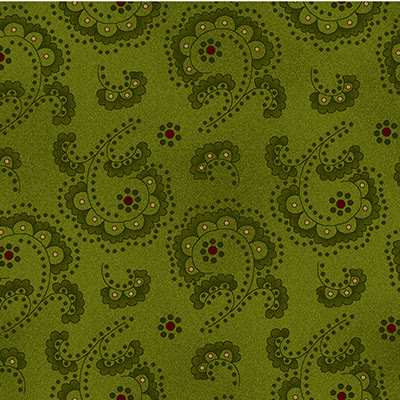 When I saw the zigzag fabric, I thought it would be a fun way to make a Faux Pickle Dish pattern. This fabric line could be used for a girl or boy. I decided to put some yellow Minkey on the back to make it for my new born niece. 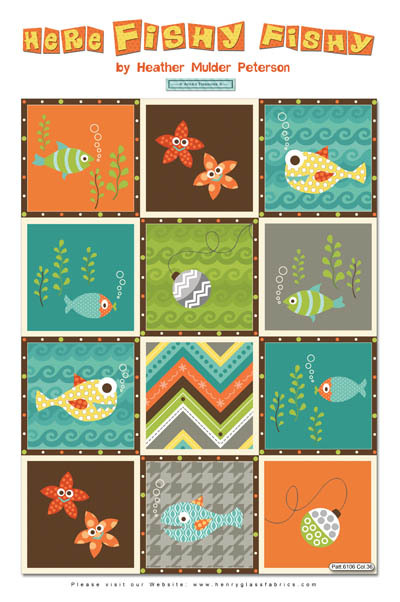 The fishies just called for a little bit of fussy cutting and I used them as the centerpiece for the quilt. I echoed the shape of the pickle dish in the outside corners to keep the pattern going even into "white space", but left the dense quilting for the busiest part of the design. I am delighted with this line and had such fun playing with it. 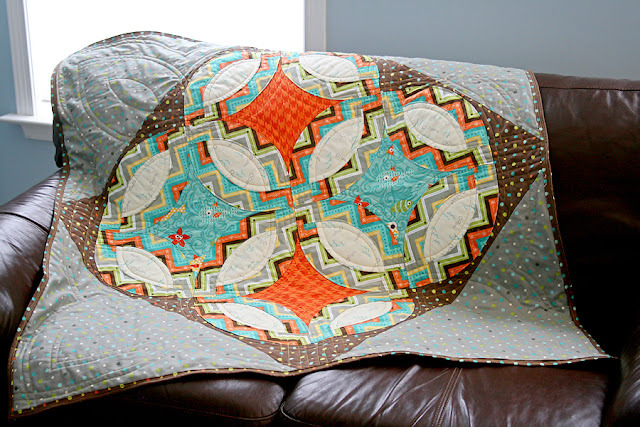 After making a small Faux Pickle Dish quilt, I can't possibly take it off my bucket list. 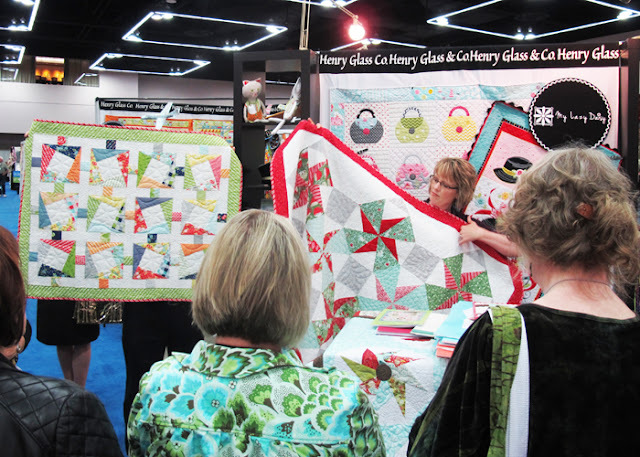 I have now just moved a real Pickle Dish quilt up higher on my bucket list. Thanks for letting me play. I just adore it. Thank you, Anjeanette! It was great getting to know you and your project is amazing. We appreciate your participation in our Desire To Inspire Challenge! Yes, we have quite a smart group of followers! 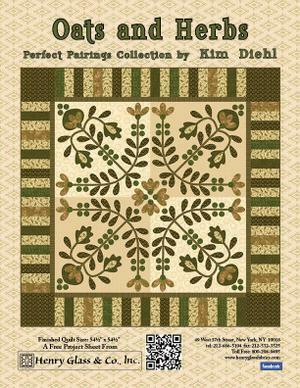 The line is Perfect Pairings by Kim Diehl. We look forward to seeing all of your projects done with Kim's fabrics when the fabrics are delivered to your local quilt shop later this summer. You can see the rest of her line here. 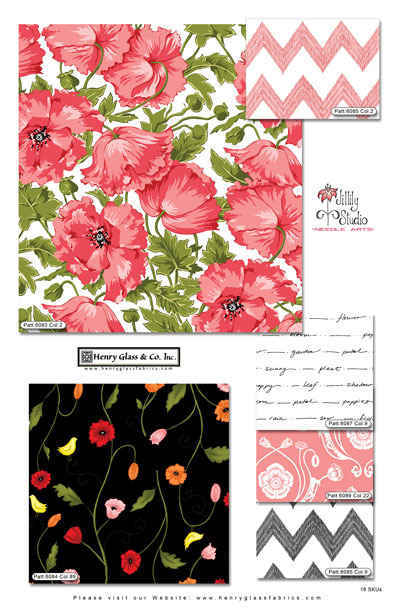 Check out the free patterns that she has designed using her gorgeous fabrics. We had set up a post about her appearance on APQ Radio on June 24, 2013 but it somehow disappeared into cyperspace. 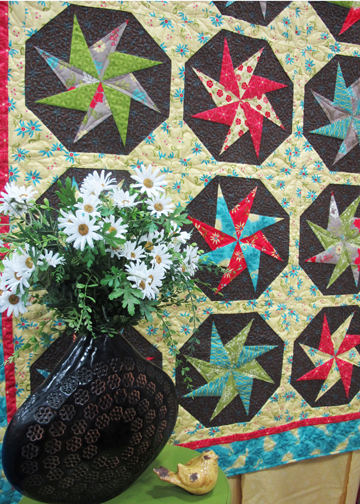 The good news is that you can hear it on the American Patchwork & Quilting Radio page here. It's Perfect Pairings by Kim Diehl. Thanks so much for the chance. ***** Giveaway is closed. Thanks! 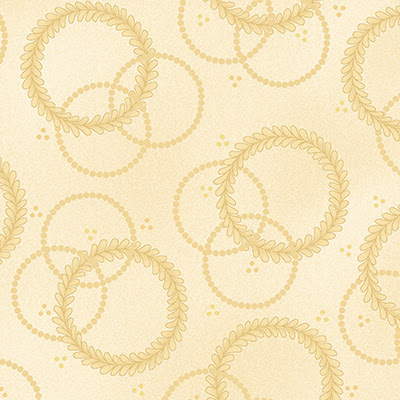 We have a new blog and Facebook header. Can you guess the name of the line? You have until midnight Sunday, June 23, 2013 to guess and we'll randomly choose a name for a bundle of fabric that we choose from our stash. 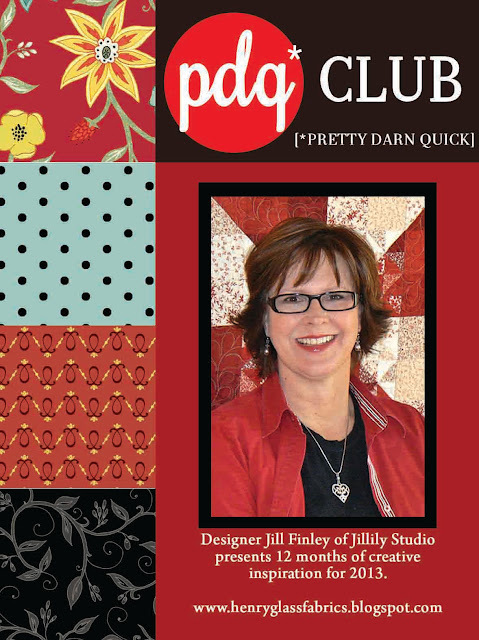 Oh, boy, you are going to love this month's installment of Jill Finley's pdq* Club [PRETTY DARN QUICK]. If you haven't done so already, check out the past projects. You can start with this link. We know people who are having babies this year. What a quick pattern. 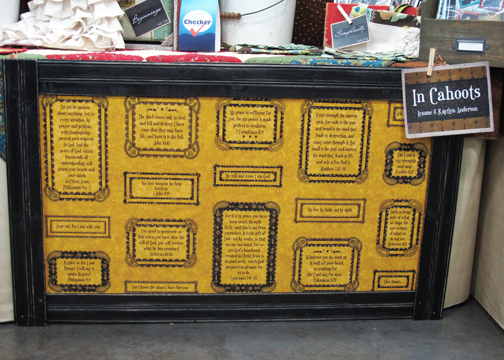 You can customize it too with any type of print but we like Jill's choices. 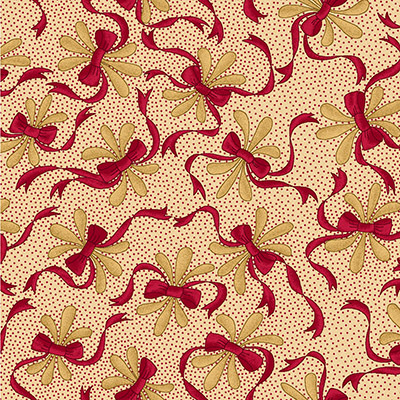 Download the pattern here to make one yourself. 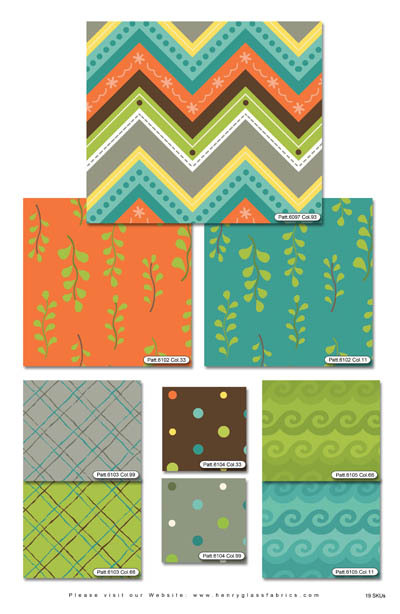 Jill's new fabric line is beautiful. Poppy Patio is so very fresh and pretty. She used some of the strike-off's from this line in this month's pdq Club project. 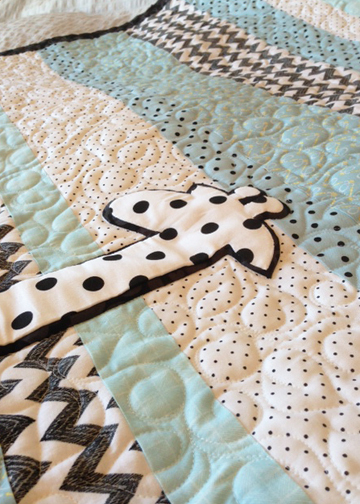 Do you recognize that cute black zig zag print? Look for the fabric at your local quilt shop. Oh how cute! A perfect beach bag. Thanks! 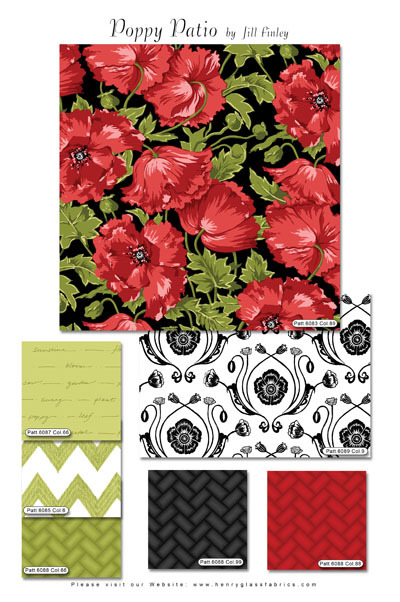 Leave Jill some love for her bag in the comments up until midnight July 19, 2013 and we will select our next winner of a random bundle of fabric! 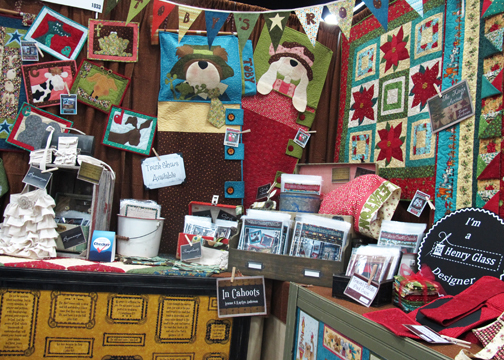 This weekend Jill will be vending at the Chicago Quilt Festival. Will you be there? Make sure to drop by her booth to say hello. She's setting up shop at booth #2023. 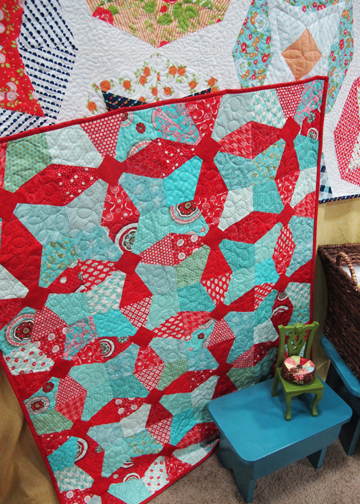 Little Quilts used Kim Diehl's trunk show in their booth at the East Cobb Quilters' Guild Quilt Show last weekend. 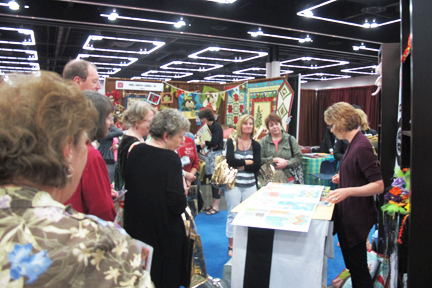 The trunk show included quilts from Kim's "Simple Charm" book. 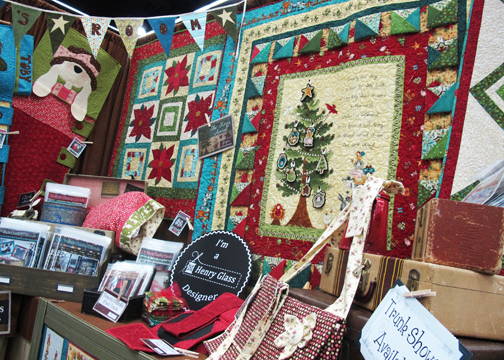 What an eye-catching booth with such gorgeous quilts! 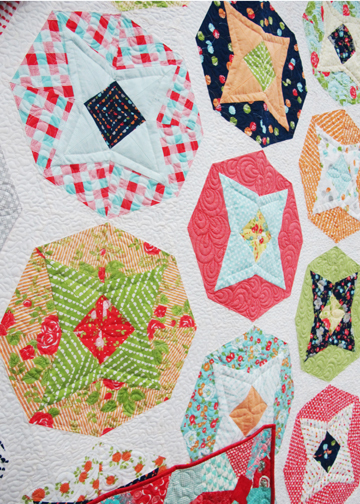 Thanks for sharing, Little Quilts. It's always great to see our fabrics out there in the real world. 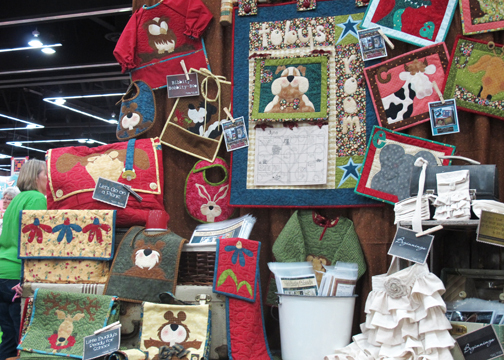 Have you been to a great quilt show recently? 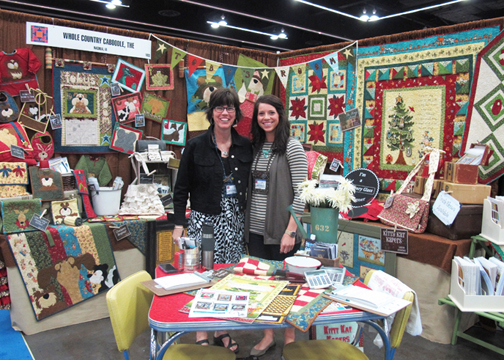 Leanne Anderson of The Whole Country Caboodle and her daughter Kaytlyn had a most whimsical booth at Quilt Market. Their critters are so fun, don't you think? 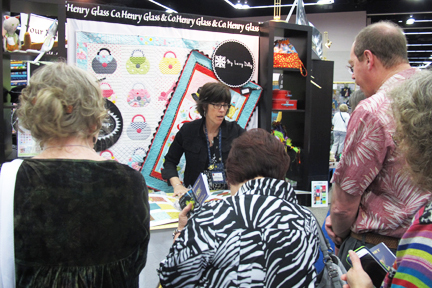 Leanne also gave a fabulous demo for us in the Henry Glass booth. 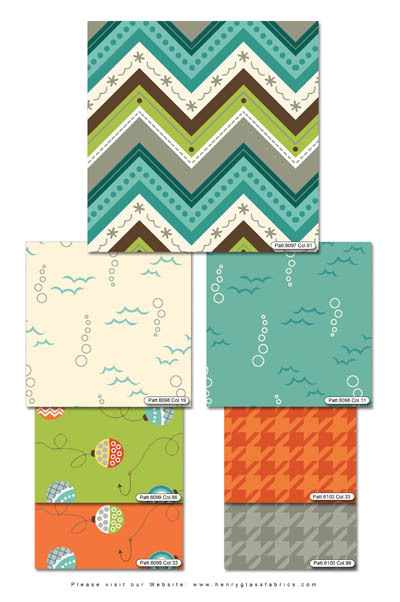 In Cahoots is a new fabric line. You can see the entire line here. 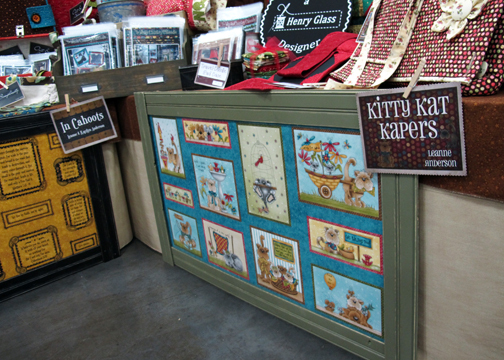 The panel in the green frame is from another new line, Kitty Kat Kapers. Adorable kitties getting into all kinds of mischief. We enjoyed visiting Leanne and Kaytlyn's booth. 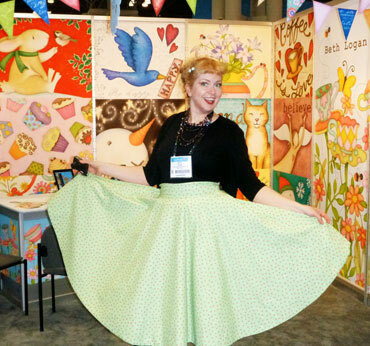 Illustrator and designer Beth Logan exhibited at Surtex in NYC recently. She sent a note along and a couple of fun photographs. Anyway - here I am in 2 of the 3 (these 2 actually had my very first zippers in them - don't look too close) and another treat, I got to finally meet Jacquelynne Steves." Looks like you had so much fun! Thanks for sharing! 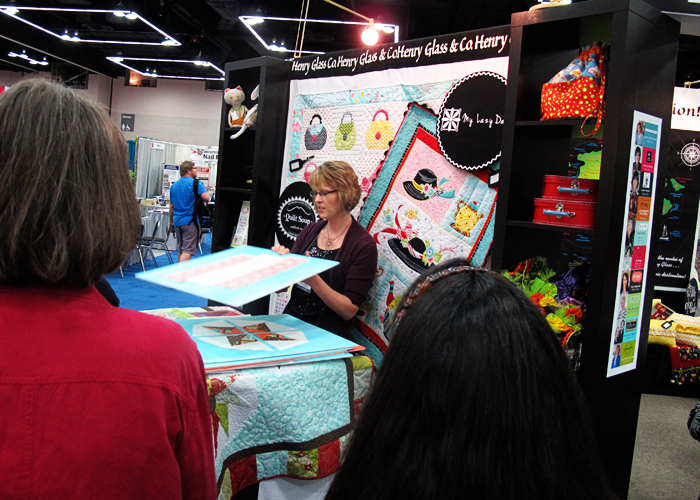 Let's get to some more fun Quilt Market photos shall we? 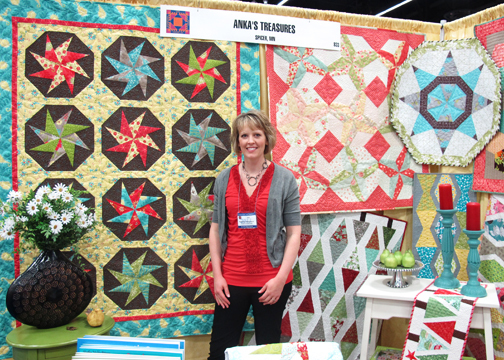 Heather Mulder Peterson of Anka's Treasures and her husband Joel were in Portland. It was so great to see them. Too bad they couldn't sneak that adorable Carter in with them! 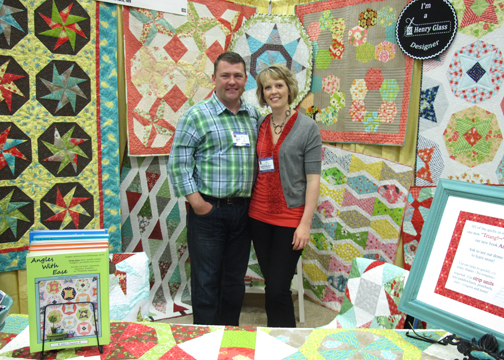 Here are Heather and Joel in the Anka's Treasures booth. The colors are so beautiful! 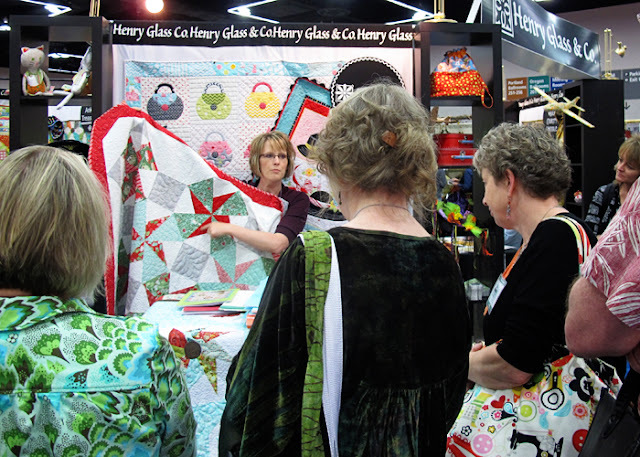 Heather did the first demo of the morning at the Henry Glass booth. She talked about her fabric and she showed off her new ruler, Angles With Ease. You can read all about it here and here. 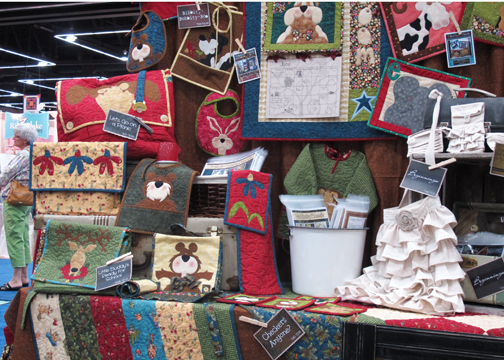 Her booth was full of beautiful color. Take a look! Thanks to Heather Mulder Peterson for some fabulous eye-candy!